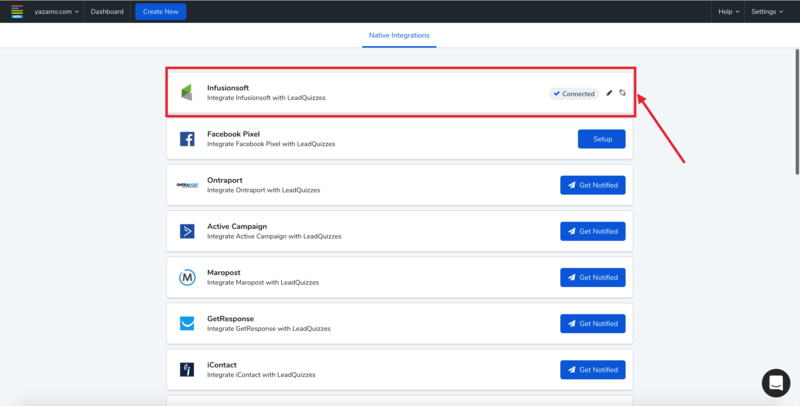 In this article, we will be walking you through setting up your Infusionsoft Integration with LeadQuizzes. 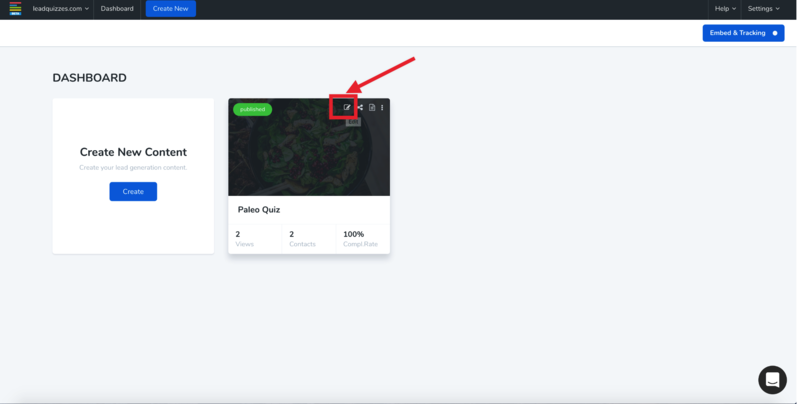 Part 1: Connecting LeadQuizzes with Infusionsoft. 1. Navigate to your LeadQuizzes account dashboard & click "Settings" in the top right-hand corner & select "Integrations" from the settings menu. 2. On the integrations page, find the Infusionsoft integration & click "Setup," a popup will appear. On the popup click the "Connect & Authorize" button. You will be redirected to the Infusionsoft login page. 3. 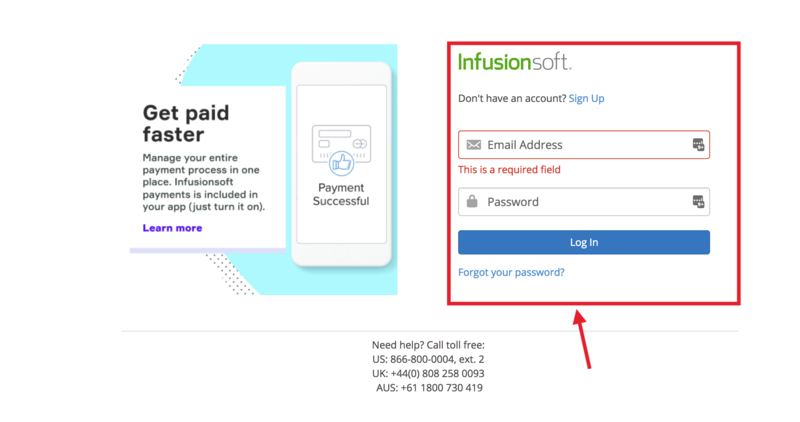 On the Infusionsoft login page, enter the username & password associated with the account that you would like to connect to your LeadQuizzes account and click "Log In." 4. Once you are logged in, you will be redirected to the Authorize Application Page. 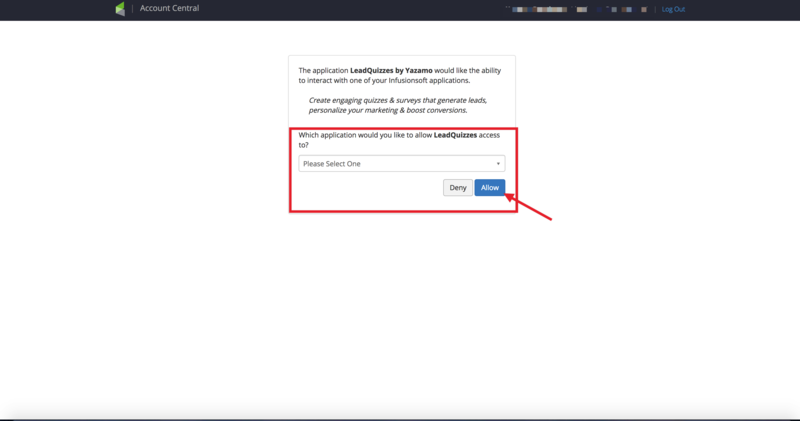 Select the Infusionsoft account that you would like to connect with your LeadQuizzes account and click "allow." You will be redirected back to your account LeadQuizzes Integration page after you click "allow." 5. 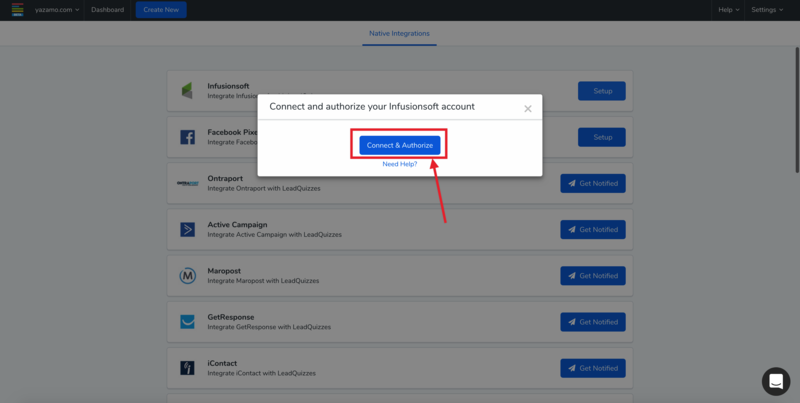 Your Infusionsoft Integration should now say "Connected" on your account integration page. 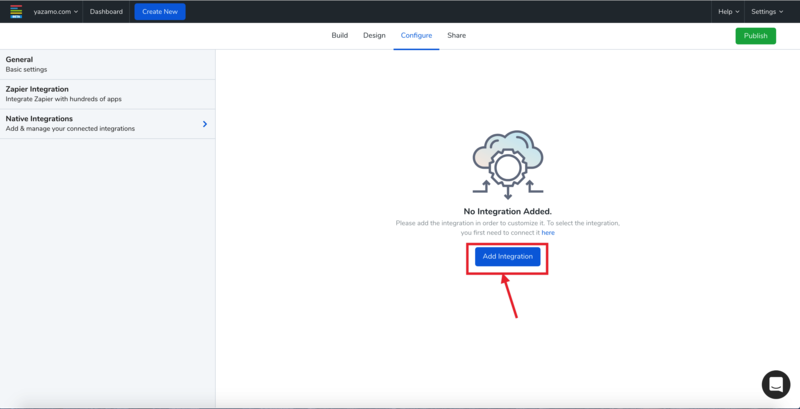 You can edit your integration at any time by clicking the pencil icon on your infusionsoft integration or disconnect your Integration at any time by clicking the disconnect icon. Part 2. Configuring your Infusionsoft Integration & sending data to Infusionsoft. 1. 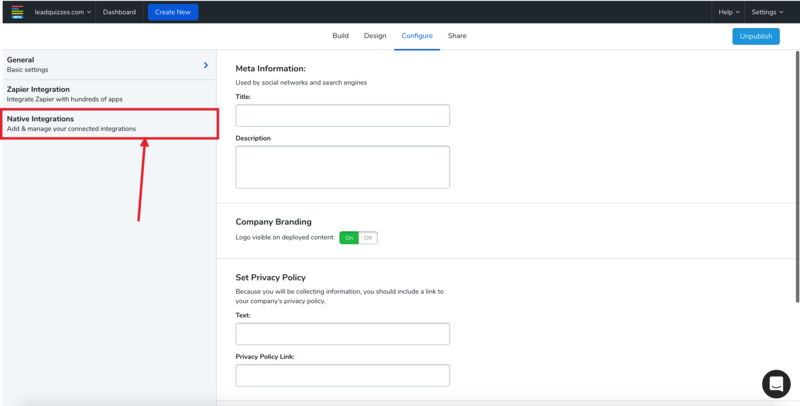 To begin passing data over to Infusionsoft, you will first have to select the content you would like to configure Infusionsoft for & Click the "Edit" icon on it. 2. Once you are in the Content Builder, click "Configure" on the top menu. 3. On the configure page click "Native Integrations" on the left side. 4. Click "Add Integrations" button on the native Integrations Page. Note: All integrations configured for your particular LeadQuizzes content will appear under the native integrations page. 5. On the configure Integration popup window, select "Infusionsoft" from the drop-down menu. Only integrations setup on the Integrations page in your website property will appear on the drop-down menu. 6. 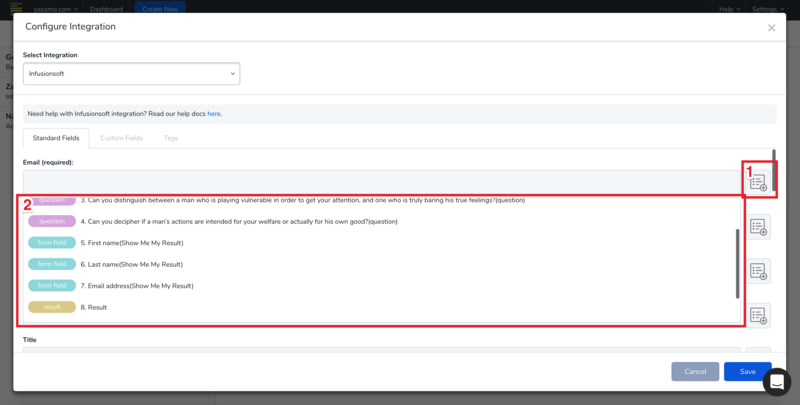 All your Infusionsoft fields & tags will be loaded onto the configure integration popup window. They will be separated by three tabs. Standard Fields tab contains default Infusionsoft contact record fields. Custom Fields tabs contains contact record fields that you created in infusionsoft to store specific data on contacts in your infusionsoft account. Click here to learn how to create custom fields in Infusionsoft. 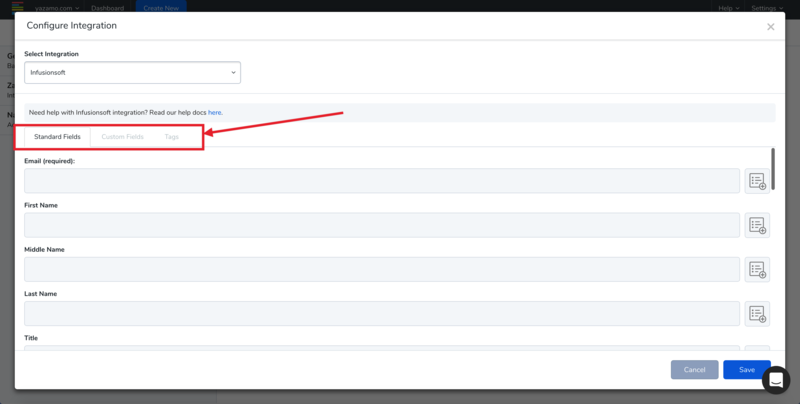 The tags tab, allows you to assign a specific tag to any lead/contact collected from your LeadQuizzes content. 7. 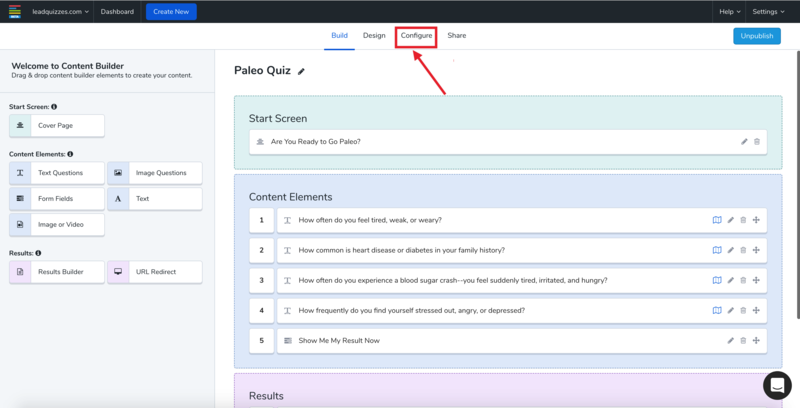 To map your LeadQuizzes content data to any of your Infusionsoft fields, click the "map data" icon next to the field you would like to assign data to and select the LeadQuizzes content element from the drop-down list. 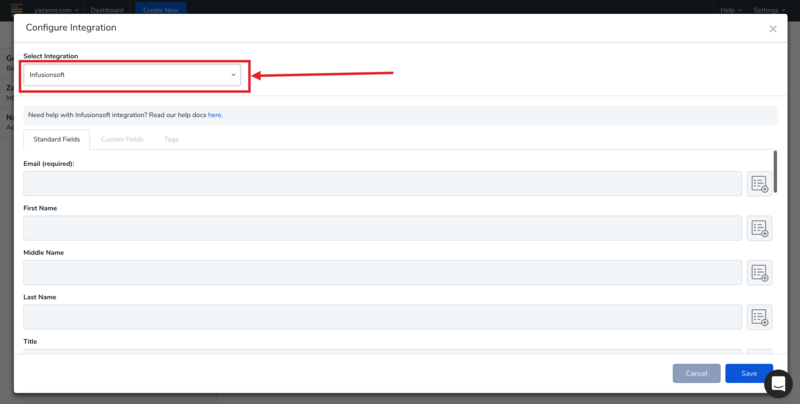 Note: To send data into Infusionsoft, your LeadQuizzes content needs to have the email field enabled. 8. Click the "Save" button to complete configuring your Infusionsoft Integration. Note: LeadQuizzes will only send the data of contacts/leads who complete your LeadQuizzes content to Infusionsoft. This means if someone abandoned your content half way through that information will not be sent to Infusionsoft. You can still view the incomplete information by doing a data export.